Nothing like seeing a brawl between Yinzers at Heinz Field on every national news service. Joys of NFL night games ... tailgate at noon for an 8pm start. No doubt there were kids near those two idiots. Guy should have stayed down after the headbutt. Oh there are kids in the top left corner of the shot. I don't feel comfortable taking my wife to a game let alone my kids. Scary thing is that those aren't cheap seats. Dropping $175 a seat doesn't guarantee that you'll be out of the drunken fray. That’s nothing. We Eagles fans threw snowballs at a stand in Santa Claus 50 years ago this month during halftime festivities in the middle of a Nor’easter. The media has never let anyone forget about it. In the great words of Forrest Gregg "You don't Live in Cleveland. The last Steeler game I went to was a Sunday night game, I sat in the same general area where this fight happened and there was very nearly a similar incident between a couple of dopes on either side of us. I don’t think there is anything more overrated than the experience of going to an NFL game. Give me my big crystal clear tv and my couch and you can have the traffic, weather and drunk idiots. If I never see another Steeler game in person that’s just fine with me. 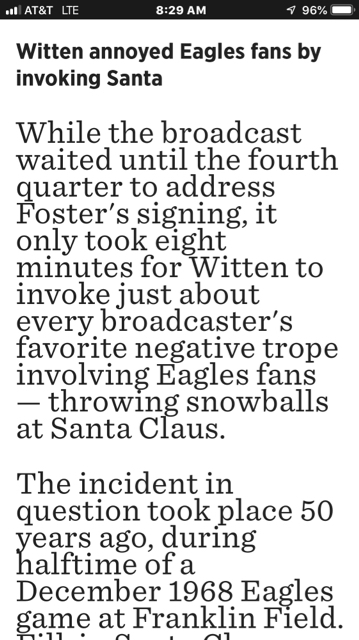 Jason Witten right on cue last night ‘s MNF Iggles game about Santa. It gets better. Now there’s a photo of a woman in Chargers gear getting grabbed by the the throat by a very large male Steeler fan. And she also happens to be pregnant. Lol. No. Fat white guy. Homer says she should "grow a pair". Yep. Cause this is ‘Merica. Oh look a photo of a steelers fan choking out a woman in a chargers jersey popped up today. Pittsburgh is the classiest City I’ve ever had the pleasure to visit. It’s amazing how well a city full of functional alcoholics behave themselves as long as their ole ball club wins a football game. No doubt. Last week at the Creed 2 opening I headbutted the guy beside me in an armrest dispute. Then for fun I put wife his wife in a figure-four. Normal behavior. Its not a human thing exactly, but drunken violent jerks are all too common.